Castellammare del Golfo is an attractive seaside town on the north-western coast of Sicily, between Palermo and Trapani (not to be confused with Castellammare di Stabia in mainland Italy, near Naples). The historic little fishing port has a very picturesque location, below steep mountain slopes, with a handsome curved harbour at the foot of a small headland topped with a castle. Castellammare is just touristy enough that visitors don't feel out of place, but it isn't overcrowded with hotels and it has an authentic Sicilian 'feel'. 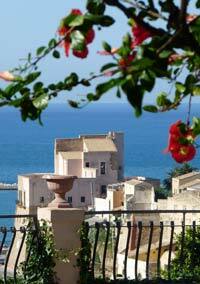 Castellammare del Golfo's principal attraction is the sea. The town's little fishing and pleasure port, called the Cala Marina, curls to the west of the castle promontory, and makes a pleasant stroll, punctuated with bars and restaurants. The harbour-front route can get sadly busy with traffic - Sicilians enjoying a car-and-scooter-borne passeggiata - but when temporarily pedestrianised in the evening the street is taken over by promenading visitors and locals passing the time of day and inspecting the fish displayed in cabinets outside restaurants. There are still small working fishing boats in Castellammare, and you may see fishermen mending their nets on board, or selling the day's catch at rickety tables on the quayside, while hopeful harbour cats prowl along searching for scraps. An ancient route leads up to the castle from the harbourside: a flight of steps climbing through a stone doorway. This brings you to the oldest part of the town, a defensible citadel at the tip of the promontory. From here you can visit the castle, head inland up the long straight road towards Castellammare's grid of more modern streets, or cross the narrow headland to a panoramic promenade high above the sea. Two restaurant-pizzerias up here have great views over the castle and along the coast. Castellammare's stumpy castle (Castello) is built on an obviously ancient site and claims Arab and Norman heritage, though the headland must been a fortified site for much longer. It's likely that the bay was the harbour for the Elymian people of Segesta, famed for its surviving Greek temple. Today the castle is equipped as an interesting little town museum (free entrance), though there's a disappointing lack of 'castle' atmosphere. Only some of the museum's displays were translated into English when I visited, but it is still worth popping in for a visit. There's a room with displays about the tuna fishing industry, historically so important to this part of Sicily, though nearly extinct in the Castellammare area. Information boards are in Italian, but historic exhibits (such as the rough boat-hooks used to bludgeon the unlucky tuna and pull them aboard boats) and a short 1950s documentary film, shot at Scopello, are accessible to all. During the film, watch out for the Rais, the leader of the tuna fishery, the traditional working songs of the fishermen and get an idea of how complex and entire a world the tuna fishery (tonnara) was. Men lived in communal buildings during the fishing season, labouring on nets which were then built into a sequence of net 'chambers' in the sea, into which the migrating fish would be shepherded, culminating in the 'Room of Death' where the nets were raised and the fish met a brutal end. Apparently at the Castellammare tonnara, one of the first fish caught was dedicated to the Madonna del Soccorso, placed on a floral float and paraded to church (later it was sold in the market and the proceeds donated to the church). Another room in the museum is dedicated to an important local festival in which the English play a significant part. The re-enactment of the Madonna del Soccorso takes place on 13 July. The story recounts that in 1718 the Royal Navy pursued a Spanish vessel into the port here, and the castle defenders unwisely fired upon the English vessel, which returned fire with much heavier artillery. The people of Castellammare 'prayed and fled,' whereupon a vision of the Madonna appeared with a flock of angels descending steps from the hill, thus scaring the English into flight (it would be interesting to confirm these details with the ship's log). Nowadays Castellammare del Golfo dresses up as angels and English marauders for a historical re-enactment, fireworks display and waterborne procession. One feature of Castellammare's history not featured in the town museum is its past notoriety as a Mafia town with links to both the American and the Sicilian Mafia during the course of the twentieth century. There is, however, no hint of the town's shadier history visible to the tourist. 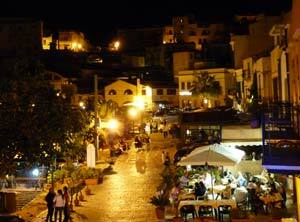 Castellammare simply seems a comfortable, pleasant and innocuous seaside town. There's a historic little church, the Madonna del Rosario, (generally closed) right outside the castle in the inner citadel. The town's principal church, the mostly-eighteenth-century Chiesa Madre, lies in the next line of defences. On the hillside beyond the harbour is another small church dedicated to the Madonna, up a flight of steps from the town. This chapel is dedicated to Santa Maria della Scala, commemorating an occasion when a shepherdess was saved miraculously in a storm. As a holiday-maker, you may not wish to wander further than the picturesque harbour and castle. The upper town, however, is pleasant enough, though the main thoroughfares can be choked with traffic. Corso Garibaldi is lined with fairly substantial buildings, some of them appealing and historic. In this everyday part of town you'll also find useful shops and businesses, a couple of pharmacies, the bus station and more places to eat and drink. Castellammare has a pretty little central park, opposite the elegant town hall on Corso Mattarella. The park has a small children's play area, shady trees, benches for the ever-present old men, and views over the harbour. The steep hill above town is the 1164 metres-high Monte Inici, which contains a number of caves, including some of archaeological interest. In the harbour Cala Marina, there are several businesses renting out boats, cars and scooters and organising excursions. Boat trips are popular but don't run daily outside summer months; you should telephone in advance or ask your hotel to do so for you. In the summer there are frequent boat excursions to San Vito Lo Capo, a seaside resort beyond the Zingaro reserve, which usually give you time to see the town, view the reserve and Scopello from the sea, and swim in a cove. It is also possible to try 'pesca turismo', fishing tourism, going out with a fisherman in his boat. The tourist information office, quayside fishermen or Ristorante La Cambusa can put you in contact with fishermen who'll organise a trip. Hiring your own boat is an adventurous way to explore the attractive coastline west of Castellammare, or visit less accessible beaches and coves. There are sandy beaches (more below) to the east of Castellammare, and some more scenic coves in the steeper coastline towards the Zingaro nature reserve. The small beach at Guidaloca is pretty, convenient for drivers, and equipped with sunbeds and a children's pool, while the rocky coves at Scopello and within the Zingaro nature reserve appeal to swimmers and more energetic beach-lovers (be aware that in the summer, there are many of these, and bays become crowded). Scopello is a pretty village above a legendarily beautiful cove housing a former tuna fishery, the Tonnara di Scopello. It makes a good excursion, and there is a diving centre at Scopello for active holiday-makers. The coast and hill paths of the Zingaro reserve just beyond Scopello are popular with walkers, though you should note that there's little shade during the hot summer months. If you are driving in this direction, don't miss the popular belvedere above Castellammare which has good views over the town and coastline. Castellammare del Golfo has a small, not particularly helpful tourist office next to the castle, open Mon-Fri, closed lunchtimes. You'll probably find your hotel receptionist is better at providing maps and all the advice you need. In Castellammare itself there's not a great deal to do other than potter, eat and drink. Though these are enjoyable activities in attractive surroundings, without a car or the desire to rent a boat, I felt I'd 'done' Castellammare del Golfo in a two-night stay. However, if you have your own transport, or are prepared to plan your sightseeing around bus timetables, the town makes a convenient base for visiting Segesta, the Zingaro nature reserve, San Vito Lo Capo, a choice of beaches and other sights dotted around this north-western corner of Sicily. Holiday-makers with hire cars, and those planning to spend time on the beach, could be content here for a longer period. There are several restaurants along the harbour-front with tables outside or within glazed terraces. These offer pretty similar fare - local pasta dishes and lots of fish - at fairly reasonable prices. 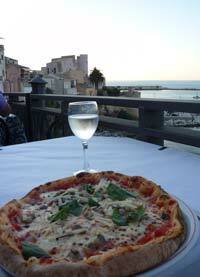 I tried L'Approdo, which had friendly service and views of the the harbour. The bars are more variable, some with loud music and more expensive than others, so you may want to be picky. Out at the edge of the harbour is a shack with plastic tables and chairs which serves filling pasta and seafood - hopefully - straight off the boats. There are more restaurants with sea views up on the headland the other side of the castle, including a couple of places high above the sea on a panoramic terrace. I ate at La Timpa, which serves filling and good-value pizzas in the evening, at tables right on the cliff edge (there's a railing, but if you suffer from vertigo you might prefer a less panoramic table). Note that the wood-fired pizza ovens are generally only fired up in the evenings; you may see the wood stacked outside the restaurant. If you don't mind being a bit further from the sea, you'll find more places for meals and takeaway food up around the centre of town, inland from the castle. 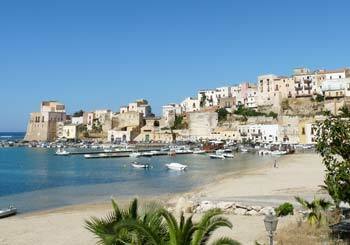 There is a rough sand beach at the back of the harbour in Castellammare, though this isn't the cleanest of locations. 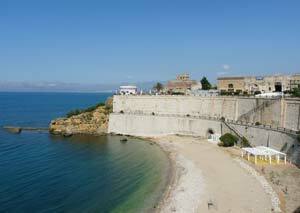 There is another beach in town, huddled beneath high walls and cliffs, to the east of the castle. The real beach action, though, is a couple of miles east of the town, where a long sandy beach starts, stretching for miles along the Golfo di Castellammare, dotted with beach establishments and amenities. If you're relying on public transport, the Russo station bus service stops along this beach, called Spiaggia Playa, in summer. If you are happy with tiny rocky coves, swimming from rocks or boats, you could head out to Scopello and the Zingaro nature reserve, by car, bus or on one of the summer boat trips which allows time for swimming and sunbathing. Castellammare is somewhat irritating to reach by public transport, as the railway station is a few miles outside town, on the long built-up road which runs alongside the beach east of town. A bus operated by a company called Russo provides a connection with trains, but doesn't run on Sundays and doesn't appear to meet every train. Russo timetables are available on their website (see links panel) and outside their office on Corso Garibaldi. We arrived on a Sunday and found no bus, but discovered, as so often in Sicily, there is an ingenious and tax-dodging alternative. I asked for information at the bar opposite the station, and the kindly barmaid found me an old man, one of several sitting outside, who would drive us into town for a fee (typical offers were €10-€15). Castellammare del Golfo station is on a regional railway line connecting Palermo with Trapani. There are several trains a day, but travellers should check timetables in advance, and note that some Trapani trains are much slower than others. There is a ticket office at the station, but its opening is limited and it may be a good idea to purchase tickets in advance; you can buy regional train tickets at a tabaccaio (indicated by a 'T' sign) on Corso Garibaldi. The bus station in Castellammare (where the Russo station bus stops) is on Via della Repubblica, still some way from the tourist part of town, though this distance is walkable. The harbour is an additional steep downhill from the main town, so if you're staying there, I'd recommend a taxi (or old-man-with-car) to/from the station. It is, however, worth enquiring locally whether buses are stopping in Piazza Petrolo, a more convenient stop for tourists, as summer services are timetabled to do so. The bus station (autostazione) is little more than a couple of shelters and a bus sign over the road, but this is nevertheless the hub for buses operated by various companies which connect Castellammare with other local towns and villages such as Alcamo, Scopello, Segesta, Trapani and Palermo. None of these buses are very frequent, so you should check timetables and plan ahead. If you want to explore the area without a hire car, your hotel should be able to put you in touch with taxi firms which organise excursions for a set price. If there are two or more of you travelling, this can be a convenient and cost-effective way to get around without being dependent on restrictive bus timetables. 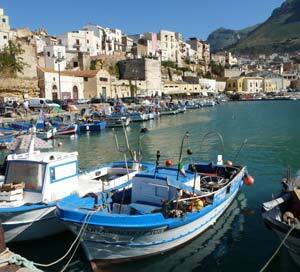 There are two convenient airports for Castellammare, Palermo Airport and Trapani Airport. 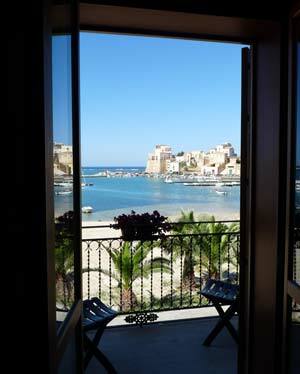 Castellammare has a handful of good places to stay; a couple down by the harbour and others in the upper town. There aren't a huge number of hotels in town, though, so I'd recommend booking in advance. The best views in town are from the modern little Hotel Cala Marina, right on the waterfront (book well ahead for one of their three harbour-facing rooms with balconies, as pictured left). For a budget option, try the Locanda Scirocco - a budget 2-star in the town centre, uphill and inland.